It’s that time of year when gardeners take a step back for a moment to enjoy the fruits of their labors. What better way to do that than with a delicious cocktail made out of ingredients grown in the garden? 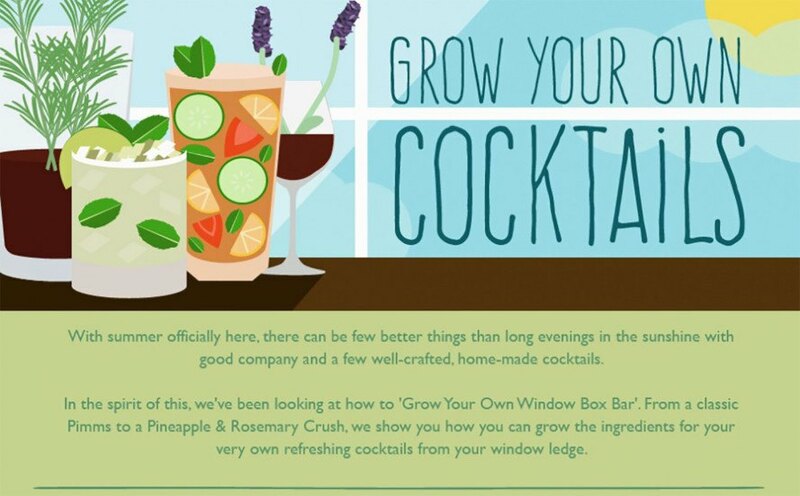 From a spicy lavender collins to a refreshing rhubarb basil Bellini, the following infographic has a plethora of tasty drinks to reward you for all your – or your local farmer’s – hard work. This is great! These look tasty and like a good drink for the hot summer nights. Plus, all of these cocktails include some of my favourite herbs - mint and lavender. Anything with these two has both great aroma and refreshing taste. I think I'm going to try all of these, one by one. Perhaps by the end of the year I'd have tried them all! It's that time of year when gardeners take a step back for a moment to enjoy the fruits of their labors. What better way to do that than with a delicious cocktail made out of ingredients grown in the garden? From a spicy lavender collins to a refreshing rhubarb basil Bellini, the following infographic has a plethora of tasty drinks to reward you for all your - or your local farmer's - hard work.